Only a few more sleeps now until Karl Urban kicks the big-screen in, as he stomps his authority all over the role of Mega City One's greatest champion, Judge Dredd, in Dredd 3D. Setting the stage for the long awaited action-er is a new, free prequel comic, from those crazy bastards at 2000AD. While you might have to apply the movies already iconic slo-mo moves yourself as you read it (and you thought rehearsing those Matrix bullet dodges would never come in handy), the best part is you don't have to go anywhere to read the sucker. 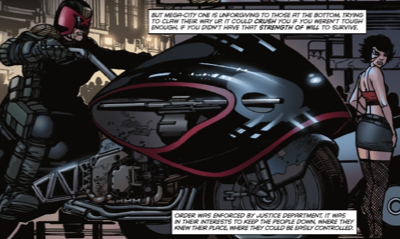 It's free, in colour and Dredd-full, right here. Plus it introduces Ma-Ma the film's main protagonist, so what's not to love? thanks for posting this Dan. i won't be able to read it till later but i'm really interested in learning more about Mama. i'll check back in with ya later mate. by the way, check out the digital mock up i have on the current Rom posting. i made a perfect blend between some work from Santi Cass and the Brothers Hildebrandt. Dredd has gotten a lot of press overhere at IDW. I think you like this guy a little bit. I like the artwork and I'll be waiting on the review. no worries Dave. O.A. yip I get a good feeling about this flick. Sure it won't win any Oscars, but often the best films are the ones that don't even try to. looks like Blogger freaked out on you a bit mate it posted your response 3 times in a row. after reading that all i can say is that i'm gonna keep my piece holstered for a while. by the way Dan that was pretty explicit i'm surprised you posted that here. now after all that you still don't see fit to feature my Armor spalsh page. seeing it here sure would make my day. i think you need a career in sales mate! I didnt think it was too graphic unlike Armours lol but I'm sure if you stick around IADW will make your day in many ways.